This villa has been featured on TV's "My Place in the Sun" - in a program which the current owners watched in the UK, prompting them to make their first visit to the island and purchase the property together with the surrounding land. Over a number of years the property was lovingly restored and two further villas, all with private space and access, were added. The latest improvement, new for summer 2017, is the addition of a deluxe four-seater spa bath where guests can relax and take in the views - this is exclusive to Villa Branca and is privately situated. Madeira Direct have been managing holiday rental properties on the island of Madeira since 2006. We only look after apartments and villas that meet the most exacting standards - a lot of which we have looked after on behalf of private owners for a decade or more. 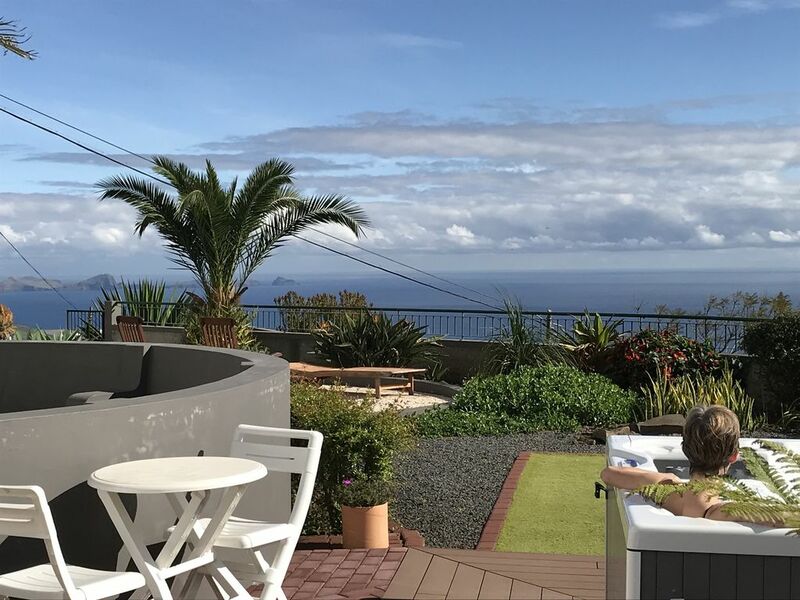 Madeira Direct has a 5* rating on Trustpilot. Private car parking is available immediately adjacent to the villa. The property was of a good standard and everything as you'd expect. Difficult to find on arrival in the dark but Peter guided us literally turn by turn over the phone when our own efforts failed. (Note to self: sat navs do not understand hairpin bends and multiple levels of mountain roads). Some lovely places to visit and the weather was great for a December get away. BE WARNED HIRE AUTOMATIC CAR unless you want to spend your time practicing your extreme hill starts. We are delighted you enjoyed your stay and look forward to seeing you again. The villa has all the facilities, but is deceptively spacious, which can make it look "minimal". The housekeeper, Maria, is a star! Thanks for the positive feedback - everybody remembers the views! Stunning views from the hot tub, lovely house and gardens. I would recommend the meet and greet, we arrived late due to flight delays it was now dark, the lovely Maria, the house keeper, came to meet us at the airport and we followed her to the house, dont think we would have found it the dark even with the maps. all in all a very pleasurable relaxing two weeks. Very nice quinta in a private and quiet location. Overall we thoroughly enjoyed our holiday - communication with the agent was excellent throughout. The arrangements were easily made and all as described. Any queries that we had were swiftly answered. We loved it. Had a problem with spa, but Peter did his best to resolve it asap. Otherwise it was perfect. In the spa every afternoon after a days trip. Madeira was a paradise, food was just excellent. Prices overall very cheap. Most probably be back again.